Bernard Anthony Harris Jr. is a scientist, surgeon, astronaut, entrepreneur, and leader. He is best known for having been the first African American to walk in space, and developing the non-profit known as the Harris Foundation. Harris was born on June 26, 1956 in Temple, Texas. For much of his childhood he grew up on a Navajo reservation in New Mexico before graduating from Sam Houston High School in San Antonio, Texas, in 1974. Harris focused on science in school. In 1978, at the University of Houston, he earned a Bachelor of Science in Biology. He earned an M.D. degree at Texas Tech University School of Medicine in 1982 and completed a Residency in Internal Medicine at the Mayo Clinic in 1985. Harris’s historic rise at the National Space Aeronautics and Space Administration (NASA) began at NASA Ames Research Center, Moffett Field, California, with a National Research Council Fellowship in 1987. He trained as a flight surgeon at the Aerospace School of Medicine, Brooks Air Force Base in San Antonio, Texas before NASA hired him to work at the Johnson Space Center in 1987. After failing to qualify for the Astronaut Training Program in 1987, he applied again in 1990. His second application attempt earned him an interview for the Astronaut Training Program and his eventual selection. Harris was Mission Specialist for STS-55, Spacelab D-2 in August 1991. Two years later he flew on the Space Shuttle Columbia for 10 days. 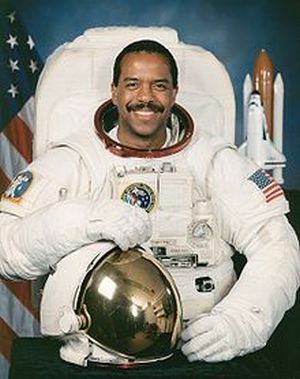 As Payload Commander for the first joint Russian-American Space Program mission, in 1995, Dr. Harris became the first African American to walk in space. He has logged more than 438 hours and travelled over 7.2 million miles in space. After leaving NASA in 1996, Harris led various companies with scientific and educational missions. In 1998 he founded the Harris Foundation, a non-profit organization that supports math and science education as well as crime prevention for America’s youth. He is currently Chief Executive Officer of Vesalius Ventures, a venture capital firm. Harris also earned a Master of Medical Science from the University of Texas Medical Branch at Galveston, and a Master of Business Administration from the University of Houston. He has served on numerous boards and commissions, and received honorary doctorates from multiple institutions. Harris also received the NASA Space Flight Medal, and a NASA Award of Merit. Dr. Harris is also a private pilot, licensed scuba diver, and a life-long believer in education, goals, and hard work. J. Alfred Phelps, They Had A Dream: The Story of African-American Astronauts (Novato: Presidio Press, 1994); http://www.jsc.nasa.gov; http://www.theharrisfoundation.org.